Among the best for West Hollywood Junk Removal, XS Trash has become a leader for our dedicated customer service, same-day scheduling, competitive price matching, and dedication to achieving 100% client satisfaction. As a licensed, bonded, and insured junk and debris removal team, we're proud to work with any residential or commercial clients in need. Whether you're clearing land for a new construction, tidying up before home renovations, or clearing out your garage for the new season, there may be heaps of junk, unwanted appliances, and debris materials that will accumulate. In West Hollywood, junk removal from XS Trash is available on a bed load basis, charging based on the volume loaded - not weight. This way, you can expect competitive rates with no additional costs for extra weight, transfers, labor, dump fees, or recycling costs. Our FREE estimates can be available for any type of West Hollywood junk removal service, whether you're seeking full-service or self-service. We can even include our licensed in-house Bobcat operators to speed along the process of loading. Bulk appliances may seem simple, but can be very difficult to eliminate responsibly and safely without a team like XS Trash on board for your West Hollywood junk removal project. Our 21-yard-long service trucks are among the highest capacity in the industry, so you won't have to worry about whether or not we'll be able to assist you at your project. Call today for your estimate. 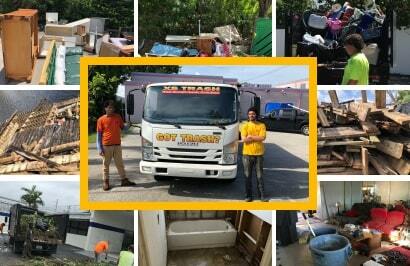 Licensed & Insured West Hollywood Junk Removal, Junk Pickup & Hauling.